Earlier today, AMAPCEO Delegates voted overwhelmingly to adopt a report from the Board of Directors on a new governance model for the Association. The new model will begin to be implemented this fall, when AMAPCEO members will have an opportunity to directly elect their new, expanded Board of Directors. The vote concludes a years-long process of considering changes to governance. The new model features a unified Board of Directors, elected from within twelve geographic Districts, as well as four Executive Officers elected by Delegates. It is designed to help build a stronger AMAPCEO by focusing resources and energy on providing member services. A new “Activists and Leaders Forum” will also be introduced starting in 2017. The forum will bring together a broad group of activists three times each year for skills development, educational workshops and relationship building opportunities. You can learn more about the new governance model by reading the Board of Directors’ report “Building a Stronger AMAPCEO.” You can also learn more about the history of AMAPCEO governance review and the case for change on the Stronger Governance webpage. Over the coming months, we will be communicating much more information with members about the transition. Stay tuned to your email and your local workplace bulletin board! 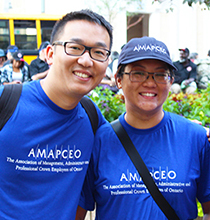 More about AMAPCEO and our Members: Established in 1992, the Association of Management, Administrative and Professional Crown Employees is a bargaining agent that represents 12,000 professional and supervisory public servants, most of whom work directly for the Government of Ontario in every ministry and in a number of agencies, boards and commissions; in 130 communities throughout Ontario and in eleven cities outside Canada. 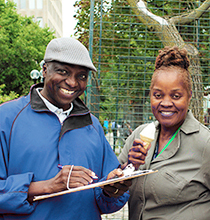 We also represent employees outside the Ontario Public Service in: the Office of the Provincial Advocate for Children and Youth; Waypoint Mental Health Centre in Penetanguishene; Public Health Ontario; the Ontario Racing Commission; Health Quality Ontario; the Ontario Arts Council and the Office of the French Language Services Commissioner.